Simply select our products which will list all the latest bag styles available. Finding the right bag to meet our client’s brief is always our priority. So if you’re looking for creative bag ideas, just fill out our online form, and we will do the rest. We understand that we have a responsibility to help reduce the impact our bags have on the environment. That's why we are committed to researching and identifying new, improved and safer materials and processes. 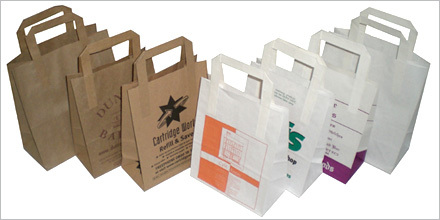 Our range of environmentally friendly bags are manufactured from recycled paper and are also 100% biodegradable, making them a perfect low cost way to get your green message noticed and also provides a solution to the upsurge in corporate environmental responsibility. You can use our Contact Form or you may phone, email or write to us. You can also use our “Request a Call Back” function which can be accessed from our home page. This service is only available 9.00 to 17.30 on normal working days (i.e. Monday to Fridays with the exception of bank holidays). If you wish to use this service outside of these times we will ring you as soon as possible on the next working day. Email our Sales team at sales@paperbagswholesale.co.uk for any product related questions and orders. Once you've selected the bag(s) you would like to order, simply place your order with your artwork by e-mail. Shortly after placing your order, you will receive an Order Confirmation Form outlining the items ordered, delivery address and estimated delivery date. Please check that the details are correct and e-mail back to proceed with your order. You'll receive an e-mail artwork proof for your approval. It'll show you exactly what your logo/imprint will look like on the item you've chosen. Please return the artwork proof within 24 hours to ensure the order is not delayed. If modifications are required simply outline the changes on the proof or contact us by e-mail, fax or phone. What artwork do we accept? We can accept any format of artwork by e-mail, fax or a mailed hard copy, but our preferred format is electronically saved as a vectorised (editable) EPS file with all text turned to outlines. Please also provide your Pantone Matching System (PMS) reference numbers for your artwork. This system is used throughout the industry to ensure our printers can match colours specified by any designer. If you cannot supply your artwork in the above format, don't worry, our artwork team have the experience required to make your artwork print ready – regardless of how you send it. You will not be invoiced until your order has been shipped. We accept cheques and payment by BACS. Our payment terms for open account customers are 30 days net of invoice date.